One of Hyrum's greatest wishes has been to find a real fossil, and I promised him we'd try to go on a fossil hunt sometime this summer. 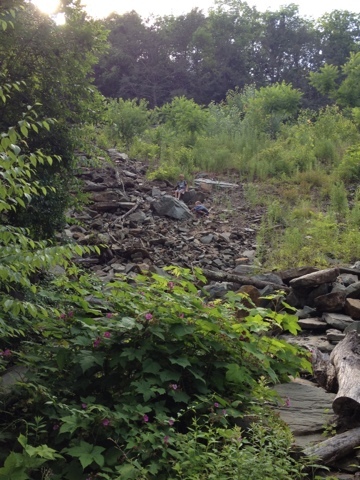 When we drove by this steep rockslide I thought this would be the perfect opportunity to find fossils. We weren't disappointed. Lily and Micah each climbed to the top, while I hung around closer to the bottom, watching Hyrum desperately trying to keep up and listening to Eve cry from the road. This trip has really showed me something about her personality I detest--the girl is a complete fraidy cat. High places, dirty places, unfamiliar places, and especially bugs of every sort, shape and size. Even butterflies. Aren't little girls supposed to adore butterflies? They climbed and we found quite a few fossilized plants in the layers of sedimentary rock. 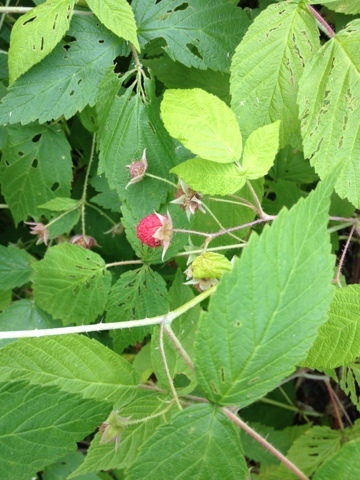 The best surprise of the whole adventure was discovering wild raspberry bushes all along the road. Although still early in the season, we filled an entire pint tub in about twenty minutes. Hopefully they will be even thicker and riper before we leave. Every day now, Hyrum begs to go to this place. Maybe we'll stop by on our way home from buying some ice cream in town today--and check for a few ripe raspberries to top it with. You are my hero for taking this on with your kids. What great memories, your adventures just scream "SUMMER!!!" Lydia is a lot like that too. I'm trying to "toughen" her up! This summer will figure in family lore forever! 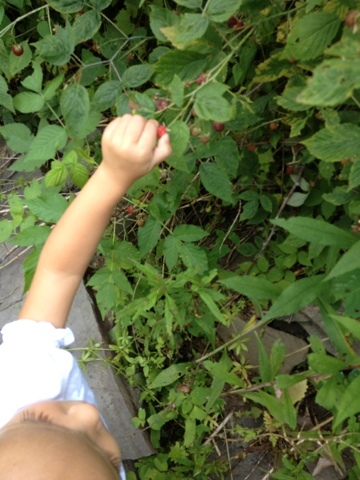 How fun to pick your own berries - you do such fun things with your kids! And Evie? Meh - she'll get tougher as she gets older. She'll want to keep up with the others. Sooner or later you were bound to have a little princess on your hands. Builds character. Yours. But my guess is she'll be as rough and tough as the rest in a year or two.